Four bestselling authors. One hellraising premise. What if the dead could be summoned from their graves;for a price? What if a quartet of distinctive storytellers took a stab at this deceptively simple idea on a dare? 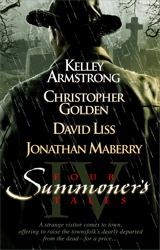 The answers lie here, in Four Summoner's Tales, as these acclaimed writers accept the challenge and rise to the occasion in four brilliantly chilling ways. It's all in the execution. . .